As part of his visit to Strasbourg, on 13 April 2016, Georgian Foreign Minister Mikheil Janelidze met Secretary General of the Council of Europe Thorbjørn Jagland. At the meeting, the Georgian Foreign Minister welcomed the CoE Secretary General’s forthcoming visit to Georgia scheduled for May 2016, as well as the CoE Action Plan for Georgia 2016-2019, the presentation of which will be held on 9 May 2016, within the framework of Thorbjørn Jagland’s visit to Tbilisi. Discussions during the meeting with the Secretary General focused on important issues relating to co-operation between Georgia and the Council of Europe; special attention was paid to the situation in Georgia’s occupied regions. The Minister provided the Secretary General with information on the recent developments in Georgia’s occupied territories, including on the statements of representatives of the Tskhinvali occupation regime regarding the possible referendum in the occupied Tskhinvali region on accession to the Russian Federation. It was emphasised that such plans, as well as the so-called treaties signed with the separatist regimes and the process of their implementation represent further steps towards annexation of Georgia’s occupied territories. Talking points also included the difficult human rights situation in the occupied regions. The Minister thanked the Secretary General for the established practice involving adopting annual consolidated reports of the CoE Secretary General on the conflict in Georgia and underlined the necessity of maintaining Georgia atop the political agenda of the Council of Europe. 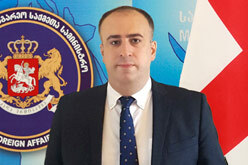 Mikheil Janelidze updated the Secretary General on the ongoing and implemented reforms in the areas of democratic processes and human rights protection highlighting the efforts towards deepening co-operation with the Council of Europe. Thorbjørn Jagland expressed his gratitude for Georgia’s valuable contribution to the process of drafting the CoE Action Plan for Georgia and expressed the hope that his visit to Georgia, together with the President of the Committee of Ministers of the Council of Europe and the Bulgarian Foreign Minister will have a successful outcome.